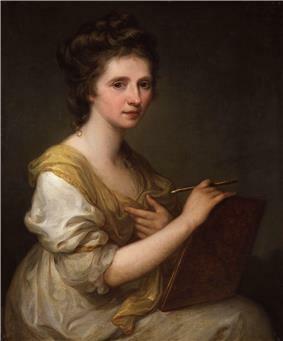 Maria Anna Angelika Kauffmann RA (30 October 1741 – 5 November 1807), usually known in English as Angelica Kauffman, was an Austrian Neoclassical painter who had a successful career in London and Rome. 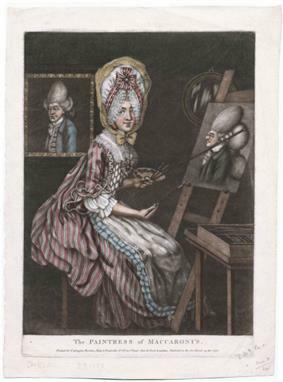 She was one of the two female founding members of the Royal Academy in London in 1768. Kauffman was born at Chur in Graubünden, Switzerland, where her father was working for the local bishop but grew up in Schwarzenberg in Vorarlberg/Austria where her family originated. Her father, Joseph Johann Kauffmann, was a relatively poor man but a skilled painter, who was often travelling for his work. It was he who taught his precocious daughter. Angelica rapidly acquired several languages from her mother, Cleophea Lutz, read incessantly and showed talent as a musician, but her greatest progress was in painting, and by her twelfth year she had become a notability, with bishops and nobles being her sitters. 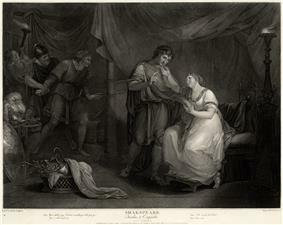 While in Venice, Kauffman was induced by Lady Wentworth, the wife of the British ambassador, to accompany her to London. One of the first pieces she completed in London was a portrait of David Garrick, exhibited in the year of her arrival at "Mr Moreing's great room in Maiden Lane." The rank of Lady Wentworth opened society to her, and she was everywhere well received, the royal family especially showing her great favor. Her firmest friend, however, was Sir Joshua Reynolds. 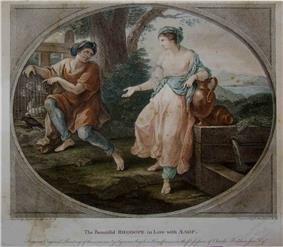 In his pocket-book her name as "Miss Angelica" or "Miss Angel" appears frequently; and in 1766 he painted her, a compliment which she returned by her Portrait of Sir Joshua Reynolds. Another instance of her intimacy with Reynolds is to be found in her variation of Guercino's Et in Arcadia ego, a subject which Reynolds repeated a few years later in his portrait of Mrs Bouverie and Mrs Crewe. In 1767 Kauffman was seduced by an imposter going under the name 'Count Horn', whom she married, but they were separated the following year. It was probably owing to Reynolds's good offices that she was among the signatories to the petition to the king for the establishment of the Royal Academy. 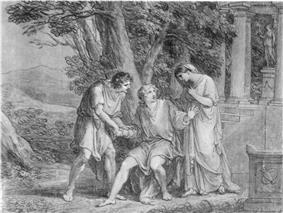 In its first catalogue of 1769 she appears with "R.A." after her name (an honor she shared with one other woman, Mary Moser); and she contributed the Interview of Hector and Andromache, and three other classical compositions. She visited Ireland briefly in 1771, and undertook a number of portrait commissions, notably of Philip Tisdall, the Attorney General for Ireland, and his wife Mary. It appears that among her circle of friends was Jean-Paul Marat, then living in London and practising medicine, with whom she may have had an affair. 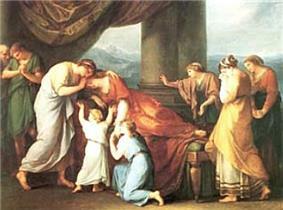 The works of Angelica Kauffman have retained their reputation. By 1911, rooms decorated with her work were still to be seen in various quarters. At Tallinn (Estonia) and in the Joanneum Alte Galerie at Graz. The Munich example was another portrait of herself; and there was a third in the Uffizi at Florence. 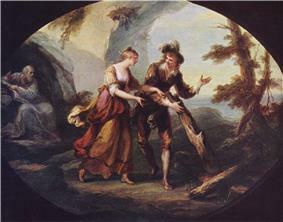 A few of her works in private collections were exhibited among the Old Masters at Burlington House. Kauffman is memorialized in Judy Chicago's The Dinner Party. ^ Kauffman is the preferred spelling of her name in English; it is the form she herself used most in signing her correspondence, documents and paintings. 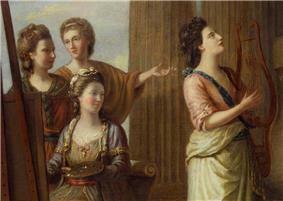 ^ Angelica Kauffman, R.A. Royal Academy of Arts Collections: Academicians. London: Royal Academy of Arts. Accessed May 2015. ^ King Francis I had become a close friend of Leonardo da Vinci during the artist's last years, and Vasari records that the King held Leonardo's head in his arms as he died. Aside from Kauffman, this story was portrayed in romantic paintings by Ingres, Ménageot and other French artists, though some historians consider it legend rather than fact. ^ Joyce Townsend, ed. (2008). Preparation for painting: the artist's choice and its consequences. Archetype Publications. p. 105. ^ Elizabeth Johns. "Keepsakes of the Beloved: Portrait Miniatures and Profiles 1790 to 1840". Washington County Museum of Fine Arts. Retrieved 20 June 2013. ^ "National Portrait Gallery - Portrait - NPG 430; Angelica Kauffmann". npg.org.uk. ^ "Documenting Anjelica Kauffman's Life and Art". JHU Journals. Retrieved 31 January 2013. 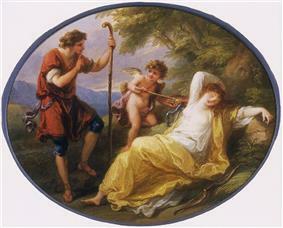 ^ "Angelica Kauffman". The Dinner Party: Heritage Floor. ^ Wendy Wassying Roworth, ed. 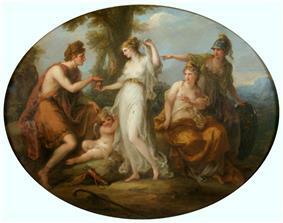 Angelica Kauffman: A Continental Artist in Georgian England. (London: Reaktion Books, 1992), 193. 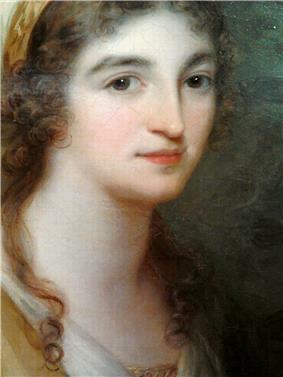 "Kauffmann, Maria Angelica". This source reports she procured a divorce from the impostor Count Horn. Roworth, Wendy Wassyng (Spring 2004). 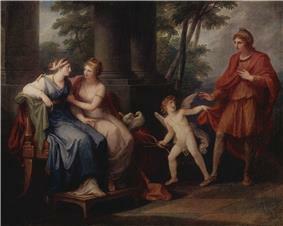 "Documenting Angelica Kauffman's Life and Art". Eighteenth-Century Studies 37 (3): 478–482.